It's been several months since Tim shared thirteen of his favorite photos, and we thought it was high time I posted some of my favorites. The time frame for my favorite photos begins after the photos in Tim's post and includes many stops that we haven't written about yet, including our most recent stop: Machu Picchu, Peru. On the western shore of the wide Mekong River, a world away from the hustle and bustle of noisy Phnom Penh, the tiny town of Kratie slumbers. The small handful of visitors it receives tend to drop by for one of two reasons: either to see the dolphins (about whom more in a moment), or to catch a night's sleep on the bumpy road down from Laos. Nobody who comes to Kratie (pronounced krah-chey) ever stays for more than a day. Two days, maybe, at the very most. Which of course means we were there for six. On our first day in Cambodia, in a backwater bordertown named Krong Ko Kong, something started to happen: the three of us began to fall completely in love with this country. That feeling only deepened in wondrous, sleepy Kampot, a place of which we have thusfar written very little but which means a tremendous amount to us. When we came to Cambodia, all I'd really known about was Angkor Wat and Phnom Penh. And, of course, neither of those have disappointed in the least. But it was with rural, provincial Cambodia that we really fell in love. When we left Phnom Penh for Kratie, we were as excited to be returning to that world as we were to have a chance to see some of the world's rarest animals (those dolphins, which we'll be getting to any minute now). We were parting ways with Klaus, who was off to Indonesia for a month to do some more scuba diving (the madman has logged over 110 dives to date). When the three of us said our goodbyes (and arranged to meet up again in Laos), we told him that we hoped to find "another Kampot" in Kratie. What we would find in Kratie would be far more than "another Kampot". We had no way of knowing that we were about to enter the most amazing chapter yet of our entire trip. Even Galapagos would be left in the dust. But I'm getting ahead of myself. First, about those dolphins. Almost a year ago, when we first set off for sunny Buenos Aires, there were an estimated 85 Irrawaddy dolphins in Cambodia's Mekong River. That is an appallingly low number, down from over 100 just the year before. 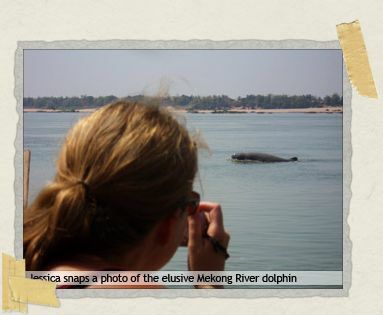 Wildlife experts hoped that the year to come would be kinder to the Mekong River dolphins. It was not. Today, there are only about 70 left. For the past few years, Cambodia has lost an average of fifteen dolphins per year (a disproportionate number of them calves). They die most often after being caught in gillnets and suffocating, but are also threatened by dynamite fishing, pollution, and even overzealous tourists. In online forums discussing what to see in Cambodia, one line of thought that we had run across over and over again was that while the temples of Angkor would still be there in a few more years, it was depressingly likely that the dolphins wouldn't. In the words of the late Douglas Adams (who quite rightfully springs to mind when one discusses dolphins), this really was our "last chance to see." We took a taxi from Kratie up to a place called Kampi, a few kilometers to the north. There the two of us boarded a small boat, along with our driver and one other hopeful dolphin-watcher. Almost noiselessly (motors are generally eschewed here so as not to scare away the dolphins) we slid out into the middle of the river. As we floated further from the shore, the world grew very quiet. For a time there was only the soft splashing of our oars in the water, and once we were in position there wasn't even that. In silence, the four of us tried to peer intently in all directions at once, desperately straining to catch sight of one of the rarest creatures in the world. The sound was very soft at first. My ears aren't particularly good (well, ok, my hearing is horribly awfully bad, the result of too much loud music in years past), and I couldn't really make it out at all at first. Someone would suddenly start pointing excitedly, but silently, and I'd see the tiniest glimpse of a gray head break the surface of the water and then disappear again. *Our dolphin-watching excursion was made possible through the generous support of our good friend Amie. 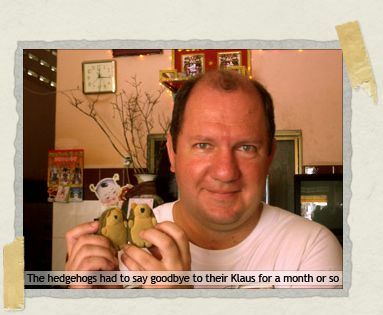 Thank you so much, Amie, not just for the numerous donations you've made, but also for making us laugh so often with your comments to our entries. After seeing the dophins, we decided to go have dinner at the marvelous Red Sun Falling restaurant, only to discover that it was still closed (they take a little siesta in the middle of the day). While sitting along the bank of the Mekong River, waiting for it to open again, something happened that was to change absolutely everything. We'd stopped in at that same Red Sun Falling restaurant for a late breakfast, before heading out to try and catch a glimpse of the dolphins. 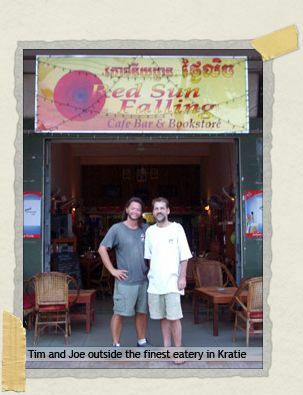 In addition to being a bar and restaurant, the Red Sun also bills itself as a bookstore, and it was one of those books that caught our attention. A very special little book. 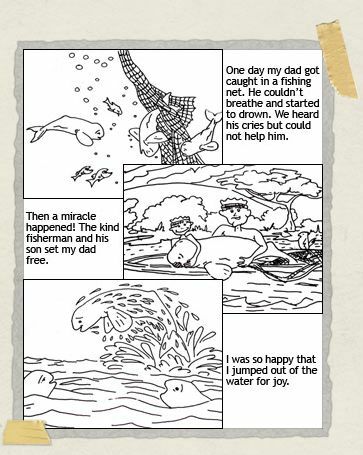 It's called San San the Mekong River Dolphin, and it's a children's coloring book. We thought it was cute, and asked the bartender if they had any more for sale, or just the copy out on display. The bartender (who turned out to be the owner as well) was a spectacularly charismatic expat named Joe. He did not in fact have any more copies for sale, but somehow from that simple question the three of us fell into a long and immensely enjoyable conversation. At some point, Joe admitted to us that he actually did have one other copy of San San but that it wasn't for sale. It had been returned to him some time ago because of a printing error, one that the customer had found a bit confusing and rather disconcerting. Joe had found it hilarious, and hung on to the copy, which he produced with a flourish. To the right are three pages from the coloring book's climax. For some reason, the page in the middle was missing from this one copy. If you re-read just the first and last page, you'll see that this error substantially changes the flavor of the scene. San San's troubling, somewhat Oedipal reaction unsurprisingly made him unsuitable reading material for the customer's young daughter. For Joe, it made that particular copy of the coloring book absolutely priceless. That night, we returned to the Red Sun Falling, fresh from our dolphin-watching and from the thoroughly unexpected events that had befallen us afterwards. As to exactly what those events were, that's a subject for another post. (C'mon, you knew that was coming, didn't you?) Let's just say for the moment that it was one of the most rewarding experiences I've ever had. In the meantime, back to the restaurant. Joe had decked the entire place out in preparation for his upcoming Valentine's Day party. Every square inch of wall was festooned with large pink hearts, cut out of construction paper and adorned in magic marker with a phrase. Many of the phrases were from pop songs or (as we later learned) Cambodian teen magazines. Most were taken quite firmly out of context, and nearly all had absolutely filthy overtones. Particularly when read over a few liters of Angkor Beer, they were hilarious. From his stool across the bar, Joe spotted us in the midst of what might be charitably termed hysterics (or more accurately "uncontrollable laughter of the crying and wheezing and snorting variety") over his little hearts. He quickly swooped over with an enormous collection of hearts he hadn't yet had the chance to put up, to get our opinion on them. For her part, Jessica contributed a new little slogan of her very own (an untidy little ditty involving chopsticks which I won't reprint here). Sometime thereafter we found ourselves sitting up at the bar engaged in the one of those long, convoluted, uproarious, and incredibly heartfelt conversations that people always seem to have when they've had a few beers. Every now and then we'd decide to have "well, just one more round" and the night just got longer and longer and longer. It was well on its way to three in the morning when we all turned in for the night. Jessica and I had earlier in the evening agreed to a little excursion the next day (all to be explained in due time, never fear), so we said our goodbyes and headed back to our hotel. Over the course of our next few days in Kratie, we ate every meal we could at the Red Sun Falling. If you ever find yourself in that neck of the woods, seek out the scruffy yet debonaire hooligan behind the bar and demand to see the hairless patch on his leg. And tell him Jessica and Tim miss him. All of this, of course, does not answer the question of what it was that made us fall so madly in love with Cambodia. None of this really addresses the question of why, during our visit to Kratie, Cambodia became (without hesitation and certainly without question) our favorite country of the entire trip. More than Turkey. Even more than Argentina. To which all I can say is, don't worry. We'll get to all that. Ban Lung Part 2: Lights Out! scruffy yet debonaire hooligan. giggle. i know a few of those. the dolphins sound beautiful. the idea of seeing an animal that is on the edge of extinction is sort of breath-taking. although of course i'd rather that it wasn't going extinct. I remember a comedy bit Ellen Degeneris did about nightly news teasers along the lines of "Its a silent killer and you could be eating it right now, we'll tell you what it is at eleven" or "He is a ruthless murderer and could be in your neighborhood, we'll tell you where he is at eleven" It just doesnt seem right to withhold such exciting/life saving information. Everytime you leave a teaser about the most amazing experience to date on your trip then leave us hanging, I think of that bit. Now you are probably thinking well its not like we are with holding life saving information…however, if you spent a day in my life you may reconsider since I could at any moment be bored to death. You dont want that on your conscience do you? hmm? So typey typey. Being a media buyer, I realize that this method will boost your eleven o'clock ratings by leaps and bounds though. Oh no, I have to jump in big time. As a soon to be 52 year old woman in the prime of her (mental) life. I'd jump on Johnny Depp so fast it would make his head spin. I wouldn't care if he made me eat those nasty tarantula things or sleep in the jungle (ok, I'd rather eat the spiders than sleep with them). I would definately like to wake up with Johnny. Hell, I hope I'd not fall asleep! Oh, and save the dolphins too. the coloring book is very funny! more treasured adventures – i love what you guys are sharing, and look forward to so much more! Debates about Johnny Dep? Man, you too really are homesick now aren't you? Besides, we all know that Timmy is way better than Johnny Dep! Of course my opinion may be a bit biased since I am the president of the "we love Timmy" fan club, but even if I wasn't the president of the fan club I'd still say that "Timmy Rules!" Of course Jessica rules too, but she already knew that. Regarding Johnny Depp…I'd have to say as Willy Wonka not doing it for me…Edward Scissor Hands getting a little warmer but still no…but you throw some gold teeth on him,some bad facial hair and poor personal grooming in Pirates of the Caribean and he shivers my timbers. I did love some 21 Jump Street Depp too back in the day. i've never understood the lure of the wild depp. i'm not against him or anything, he just doesn't ding my dong. figuratively, i mean. *hugs* Don't worry, Daddy, I promise we'll be home in July. In fact, we're going to buy our plane tickets home sometime this week. waffles, waffles…what about those waffles…? The whole Johnny Depp debate came up when we were playing the amusing game of "chuck, **** or marry"… you pick three people & then have to decide which one you'll marry, which one you simply shag & which one you'd chuck (throw of a cliff/ditch…whatever… anyway…while I might shag Mr. Depp (depends on who else is in the group) I still don't get his ever popularity with the ladies…?